Dr. Kadri Gopalnath is India’s premier classical saxophonist and the world’s foremost recognized pioneer of carnatic classical music on the saxophone. Born in Mangalore, Dakshina Kannada district, Karnataka, Gopalnath acquired a taste for music from his father Thaniappa, a nadaswaram vidwan. When he was young, Kadri saw the saxophone being played in the Mysore Palace band set. Thrilled on hearing the vibrant tone of the saxophone, Gopalnath decided to master it. 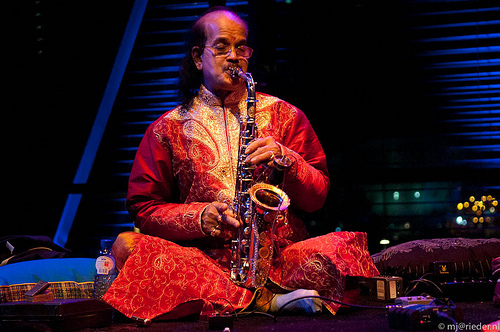 It took Kadri Gopalnath nearly twenty years to adapt the saxophone to the intricacies of Indian classical music. 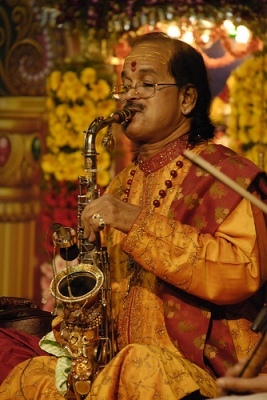 He has had to make certain modifications to the conventional alto saxophone to play Carnatic music, but his adaptation has been so successful that the great musician Semmangudi Srinivasa Iyer, the doyen of Carnatic music, has acknowledged Kadri Gopalnath as a true Carnatic music genius. Kadri studied Indian classical music under Gopalakrishna Iyer of Kalanikethana, Mangalore. He worked tirelessly to understand both the intricacies of South Indian music and the technical challenges present in playing carnatic music on a western, woodwind instrument. Kadri later met T.V. Gopalakrishnan in Chennai who identified the youngster’s talent and chistled him into an internationally famed artist. Within two years of studying under Gopalakrishnan, Kadri Gopalnath was proficient enough to deliver his debut concert for the Chembai Memorial Trust. The 1980 Bombay jazz festival was a turning point for Gopalnath. John Handy, a jazz musician from California was present at the festival. Hearing Gopalnath play, Handy asked if he could go on stage and perform alongside with him; they were instant hits among the audience members. Gopalnath has participated in the Jazz Festival in Prague, Berlin Jazz Festival, International Cervantino Festival in Mexico, Music Hall Festival in Paris, the BBC Promenade concert in 1994 at London and has toured all over the world. He has cut many albums and has recorded a number of cassettes and CDs. Together with jazz flautist James Newton, he recorded Southern Brothers. His production called ‘East-West’ is an audio-video presentation that, as the title suggests, is a fusion of Western and Indian music. This album took 6 months to produce and has compositions from Saint Tyagaraja, Beethoven and the likes. itles and honors have come Gopalnath’s way, the most cherished being the Asthana Vidwan of Sri Kanchi Kamakoti Peetam and the Sringeri Sharada Peetam. He was awarded the presidential honor of Padma Shri in 2004. Among his other distinctions are: Saxophone Charkravarthy, Saxophone Samrat, Ganakala Shree, Nadapasana Brahma, Sunada Prakashika, Nada Kalarathna, Nada Kalanidhi, Sangeetha Vadya Rathna, Karnataka Kalashree in 1996, Vocational Excellency Award from the Rotary of Madras, Tamil Nadu State Award “Kalaimamani” and Karnataka Rajyotsava Award in 1998. He received an honorary doctorate from Bangalore University in 2004. The 2008 album Blue Rhizome by the New Quartet features a tribute to the saxophonist called “Gopalnath,” composed by Karl E. H. Seigfried. I met Dr. Gopalnath (who I refer to as Kadri Mama) when I was 13 years old. He had come on a six week tour of the United States in 1997 accompanied by A. Kanyakumari on violin and Guruvayur Dorai on the mridangam. At that point, I had been learning vocal carnatic music from Sri T.N. Bala for a few years, and I had been experimenting with carnatic music on the saxophone with Bala Mama’s guidance. 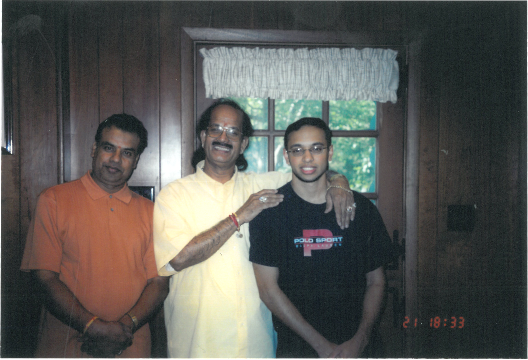 In 1997, my parents were heavily involved with a music organization which they co-founded with other Indian classical music lovers in the Philadelphia area. 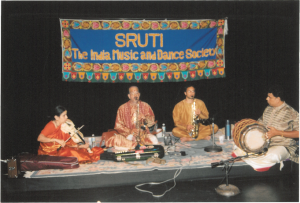 The organization, called SRUTI: The Indian Music and Dance Society of Philadelphia, had sponsored Kadri Mama’s visit, so by my fortune, he and his accompanying artists ended up staying at my parents’ house the day before his concert. During his stay, my parents had asked Kadri Mama if he would listen to my playing and give me some pointers. At the time , I was very much a beginner with no experience. I played something short for him, and like any critical and phenomenally successful musician, he proceeded to point out a variety of mistakes in my technique and general delivery. By the end of his visit, he had agreed to take me as his student in Chennai (a city in the state of Tamil Nadu, India and the world’s hub for South Indian classical music). By June of 1998, I was on a plane for India, too young to really have any strong perspective on what I was doing, but eager to try something new. The time that I spent with Kadri Mama has been inspiring. I spent the summer of 1998, the summer of 1999, and the summer of 2001 under his instruction. Since 2001, Kadri Mama has visited the United States every couple of years, so I have traveled to see him, performed with him, and continued to study. In 2012, I spent three months with him touring India, studying, and playing in dozens of concerts. There are obvious advantages to learning from a world class musician (the only of his kind in Carnatic music) and a pioneer of an art form. There are, in fact, only a handful of people around the world who know what it was like to study with him, travel with him, and be brought into his family. I would be remiss as a musician if I discussed the life of Dr. Gopalnath without talking about some of my personal experiences as his student. Kadri Mama was a practice minded instructor. He believed in teaching a lot in a short period of time and sending his students home to practice for several hours, work out the kinks, learn some things on their own, and come back with vastly improved playing. When I first started studying with him and asked him how much I should be playing per day, he told me that I should be practicing close to 6 hours per day outside of class (which anybody who has played a wind instrument knows is not easy!). When I visited Chennai, I stayed with my uncle Dinakar Rao in Mylapore during the first two summers and my uncle Ramesh Rao during my last summer. They used to take me to class on the back of their motorcycles about 5 to 6 days a week. Generally, Kadri Mama taught me one Krithi (a type of carnatic music piece and the most used in classical concerts) per day and he expected me to play it perfectly by the next class (which was usually the next day). It usually took about 45 minutes to 2 hours of class instruction to learn a composition and 1-3 hours of practice at home to play it well (depending on the difficulty). In each of my first two summers, I went on a two week tour with Mama when he was called for concerts in Karnataka (the state in South India where he grew up). These trips stand out the most in my memories of studying with him. We would travel by trains and buses over night and when we did stay in hotels he would wake me up early in the morning, put a towel in the bell of my saxophone to dull the sound, and ask me to start practicing. When we stayed at his house in Mangalore, he would often teach me 3 times a day and send me upstairs to practice. It was like music boot camp! These trips were an additional opportunity to meet different artists, and give a guru the chance to encourage his disciples. One trait about Kadri mama that I will never forget is his eagerness to perform with his students. The first time that he and I traveled together in South India was within 3-4 weeks of the beginning of my lessons (I was 14 years old). On that very trip, he took me to the famous Mookambika Devi Temple about 80 miles from Mangalore (his hometown), and without more than about 30 minutes notice, took me to the center stage area of the temple where he and I performed together for a few hundred listeners (Mookambika attracts thousands of pilgrims and worshippers per day). 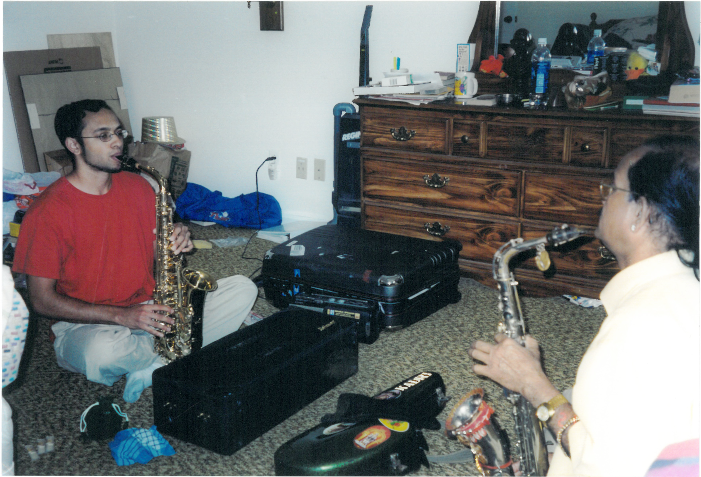 Over the coming summers, he and I played together in numerous concerts all over south India. Most teachers (particularly decorated performers) would not assume the risk of taking an inexperienced student on stage. Throughout the entirety of my studies with him, Kadri Mama has always been the type of teacher to bring his students to the center platform. Since meeting Dr. Gopalnath, I have sent a handful of my own students to study with him. Studying in India is often orders of magnitude more productive than studying in the United States. Kadri mama certainly never responded well when I didn’t practice a lot (and a guru always knows when his student hasn’t practiced! ); I would also say that learning music in India as opposed to at home in the states was often easier because there were no distractions, there was no school, there was an ever present disciplining guru with vast musical knowledge, and there was a plethora of people who understood carnatic music very well. Of course, when I was studying in India, I didn’t have access to the internet, the television was entirely in Hindi, there was no air conditioning (and Chennai is freakishly hot in the summer! ), and I had no friends my age but for my buddy Siva (who lived on IIT Chennai campus about 20-30 minutes motorcycle ride away. I should note that jumping on the back of Arun uncle’s bike (Siva’s father) to visit was a lot of fun). In this sort of environment, all I did was eat, practice, and search for the coolest part of the house to lie down and read a book (by cool, I mean 95 degrees). People who have discussed my music background with me know that I could talk about my experiences in Chennai (even 10-15 years after the fact) at long length. I decided to write this page mostly to relate a flavor of what it was to be a student of Dr. Kadri Gopalnath in the late 1990’s. I’ll close by saying that flying 10,000 miles to learn South Indian music is an expensive and highly time consuming proposition. The decision to go to India and study with Kadri Mama (a decision that was mostly formed and motivated by my parents) was among the best decisions of my life.